You’ve no doubt heard by now that Roseanne Barr is having what is very likely the worst week of her life and most definitely the worst week of her career. It all started when the 65-year-old comedienne fired off string of awful tweets yesterday morning, including one that attacked former President Obama aide Valerie Jarrett, calling her a Muslim ape. Replying to a tweet accusing the former White House staffer of alleged coverups during the Obama administration, Barr wrote: “Muslim brotherhood & planet of the apes had a baby=vj,” using Jarrett’s initials. A backlash ensued. Barr deleted her tweet and issued an apology, but execs at ABC weren’t having it. Hours later, the network announced it had pulled the plug on her show’s second season, which was already in pre-production. The response to the cancelation has been pretty predictable. Trump supporters are accusing ABC of silencing conservative voices and freaking out that freedom of speech is officially DEAD and calling for everyone to #standwithroseanne and #boycottABC! Meanwhile, pretty much everyone else is happy ABC decided to take out the trash. But nobody seems happier than the memers. #MOOD #REALTALK #FACTS #NUFFSAID From @odysseus23 – #RoseanneBarr is an absolute idiot! For what possible sense did it make to compare an African-American woman in President Obama's cabinet to a mixture of the Planet of the Apes and Muslims. This led to her show, #Roseanne being canceled immediately. #ValerieJarrett, Obama's former advisor and victim of the insult, took the high road and merely pointed out the obvious issues we still face in America as Black Americans. 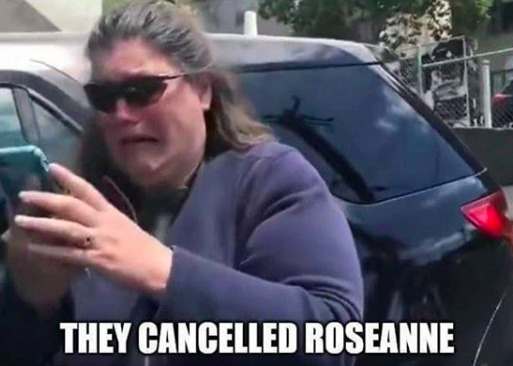 Too bad Roseanne, YOU LOSE!